This activity acts as an easy taster introduction to using CompendiumLD to map activities and units. We strongly recommend that after this taster activity you try out the real thing - watch the Getting Started with CompendiumLD SlideShow! This activity will provide a very quick introduction to the CompendiumLD learning design tool and the Task Swimlane representation which maps an activity at the micro-level. Define the learning outcome(s) that this activity expects to meet, the tools and resources you have decided to use, and your assessment strategy. Use the node stickers to map out your activity on the A3 paper. Decide yourself the best way to structure your activity map and use pens to make and explain links between nodes (5 mins for a simple activity). Who might be interested in seeing this activity view? 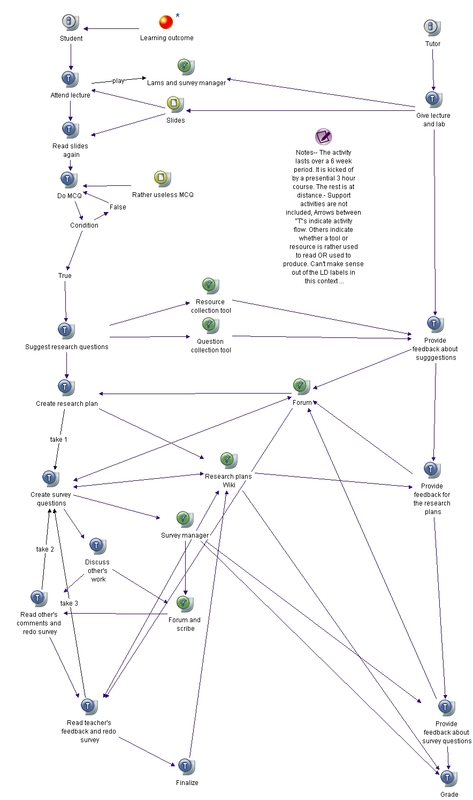 (For support teams) How might a CompendiumLD map of an activity help you talk to course teams about the resources, advice, tools and activities your department offers? Also, doesn't this "view" conflict with swim-lanes for roles à la UML activity diagram ? I think your interpretation is correct i.e. The stencils in CompendiumLD should be regarded as prompts, and are not intended to impose rigid ways of designing. The nodes in the sequence mapping stencil are intended to prompt users (i.e. learning designers) to think about different facets of the design, but it is not mandatory to use them all. Indeed, in this example only the schedule marker is used to highlight the time dependent nature of the tasks being carried out by the students and those in supporting roles (i.e. teachers and 'controllers'). We've recently published a guide to the CompendiumLD node types and there's also a map showing an example of the swimlane headers in use which I hope is helpful. I guess from reading your CompendiumLD intro that you have already seen the guide to the node types, so I'll try to answer some of the points you raise. ">Intent and challenges + what is to be learnt (isnt' that the same ?) ==> learning outcome nodes"
The “Intents and challenges” lane is intended to be used to capture aspects of the design that the designer regards as potentially problematic. It could that this is the first time they’ve used a particular pedagogic approach, or a particular tool..
“What is to be learnt” should contain the learning outcomes, and “Learning output” is to record any manifestations of learner behaviour that can be used to evaluate what is intended to be learnt. Typically these “Learning output”s will be written essays or similar, but the could be observations of a learner’s behaviour e.g. a change in the learner’s approach to their work in their practice ( e.g. as a Doctor, or Social worker etc). “Media and tools ==> tools” The idea behind the “Media and tools” lane is to group the artefacts that a learner will interact with together. 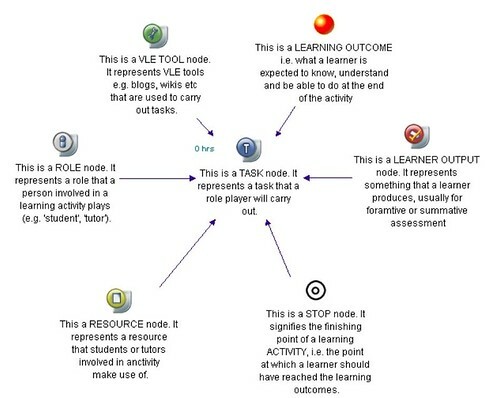 “Student ressources ==> resources (but now resources will have to be linked to tools in the LD-OU diagram ? )” The intention behind this is to separate how concepts are delivered (which can be described using ‘Media nad tools’) with the semantic content. We’ve called this ‘’Student resources’ and may change this title: any suggestions? “Support roles (where is the learner ?) “ Support roles include the teacher and any others which support the learner. These could include other learners. The learner role occupies the “Student activity”lane. I stress again that the stencils in CompendiumLD should be regarded as prompts, and are not intended to impose rigid ways of designing. Feel free to adapt and use them in your own way. Please add any examples to this cloud. I don’t think so, but am happy to be corrected! Great news to hear about the update to your mostly French intro to CompendiumLD. Did you know you can now try out translating one of the menus for CompendiumLD and running it in e.g. French? I hope I've provided enough information so that you can start to give your own view of how to use CompendiumLD. Please let us know how you get on! Cool, that answers all my questions. "Student ressources" also could be named "learning ressources". I don't think it matters a lot. On the other hand I always found tricky the sometimes not so obvious separation of tool and content (in all LD languages). E.g. I use a wiki as one-in-all tool for two classes (learning materials, course plan and activity descriptions, forum, and writing-to-learn environment). It's great to know about your use of CompendiumLD in teaching: could you post an example or a link to an example here? With respect to your activity map, there is potential to improve the layout by using a "Go to". Right-click on a node, then select 'Create go to'. This will create a 'copy' of the selected node which can be placed anywhere on the smae map as the original: when you double-click the go-to the map focus shifts to the original node. Nb - to create a copy in another map, use 'copy-paste special' . However, I know that loops are a problem - again please post some examples that are particularly difficult and I will see what we can do. The direction of the link arrows can be changed by right-clicking on the arrows, but perhaps I did not undertsand what yyou meant? In other words: It's not always clear what the "source/origin" is, the task or the tool. I suggest that maybe in a future version you might replace the default labels for arrow types (which don't make sense) with something that does, like "read", "contribute", or whatever (of course this would need some thinking and discussions). Mhh I tried to retrieve designs from 4 students that they did last semester. I did ask them to submit XML files. Now in the Windows V1.0 version I just installed, this XML format is gone, but in the same Unix version I installed two days ago it's still there. Is this a mistake or on purpose or did something go wrong during the install ? The import/export XML format should stil be available, but you have to view the full menu to see it. You do this by clicking on the little arrow at the end of the menu as shown in slides 17 & 18 in 'Doing more with CompediumLD' . I guess that you may have clicked on the arrow in your Unix version inadvertently hence revelaing the XML options, but I could be wrong: let me know if the suggestion above works or not. You are correct about the old templates. When I get a chance I wil make the old stencil available for download, but if you wnat to use it with v1.0 all you need to do is copy the stencil folder into \System\resources\Stencils then restart CompendiumLD. I have just realised that I've missed an earlier message from you ('Regarding arrows'): bear with me, I'll reply to that later today. Since I usually find stuff and I didn't you also may expect other users to miss these. So it's an ergonomics debate: Are these 2 level menus really necessary ? In most cases I think not, e.g. I really don't like the Microsoft "personalized menus" and find that it creates more problems than solving them. In reply to your earlier posting i.e. That's a good suggestion. The default labels are inherited from Compendium's origins as a tool to visualise discussions and arguments, and as you observe these do not make much sense for learning activities. Creating a set of useful labels would need some thought, but there is existing work on the kind of labels required e.g. the task type taxonomies in Conole & Fil, 2005. I agree that using a 'goto' node is not always the best solution, but it can avoid visual clutter and still show that the node occurs elsewhere. However, I think this isanother aspect that needs more work, along with loops. The simplified menus were introduced following usability tests and comments from users. I can add an option to always display the full menu - I'll put that on my 'to do' list. Just a last tiny suggestion with respect to the menus: since probably many people will use CompendiumLD without digging into the tutorials, you might consider changing the tooltip for "Export learning design" to say something like "Export selected nodes as CompendiumLD learning desing file". I personnaly don't care much for IMS/LD (since it doesn't seem to be able to take of the ground and still lacks an extension to define use of tools) but some people might become confused between LD as concept and LD as the IMS thing. I am confused about where the extra elements on the notation sheets come from. There are sections include support roles etc and I cannot find them on CompendiumLD. The notation sheets include icons from CompendiumLD's 'Sequence map' set which is described here http://compendiumld.open.ac.uk/documentation/version1.0/QuickRefGuides/stencilsAndNodes/#sequence. You can open this in CompendiumLD via the 'Tools' menu, by selecting 'Open Stencil' and then 'Sequence mapping'. Thanks Andrew. I had tried to open other toolbars but must have missed that they should be stencil instead.